Hello again, here I am with a card for someone going on a cruise maybe? Wish it were me!!!! This is a cute Vintage picture that's available from Milk and Coffee Digi Elements and is for a Challenge for Through the Purple Haze. I used paper from a 6x6 inch paper pack "Farm House Paper Company, Fair Skies", and printed an anchor from my files, colored it with my Copics to kind of give it a metal look, fussy cut it and adhered it to the card with some foam tape to pop it up. The Bon Voyage sentiment was printed from my computer and I just inked around the edges of the paper to give a little vintage look. A little jute for a nice touch and that is about it. It was so easy with the printed picture from Milk and Coffee Digi Elements and they have an awesome prize of 5 Images for the winner!! Now, that is one awesome prize!!! So it's time you get your freebie and get your card posted!! Well, my friends I am so glad to came to visit and if you are a new friend, please, feel free to browse around and if y'all would be so kind to leave me a comment below you help me so much with the inspiration I need to keep the cards posting here. 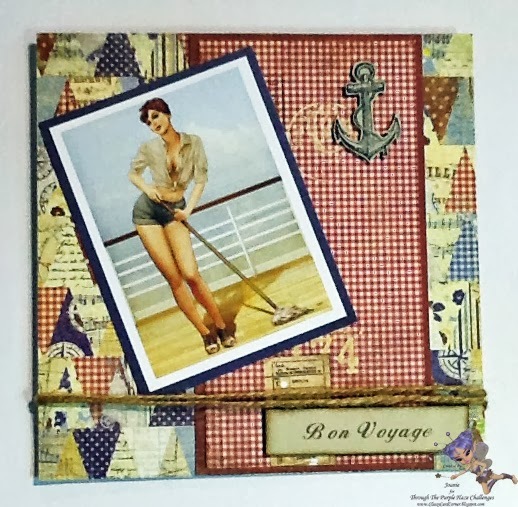 I love the nautical theme, Joanie, for your Crafts U Print project!! Love your papers! !